Our journey to Wayanad began in typical India fashion: with a delay. Our train was an hour behind schedule and became progressively more delayed. We watched the sunrise at Madgaon, sipped chai, snacked on stale PB&Js, and shifted from one foot to the other, aimlessly passing the time, eyes fixated on the schedule board. When we watched the train inch into the station, we understood why it had taken so long — and worried how long it would take to travel our nine-hour route. But this is India. So we tossed our worries aside, hopped on board, and whipped out our playing cards. Little did we know, the train would be the least of our problems. When we jumped off in Calicut, we were catapulted into afternoon chaos. The station was overflowing with people — we could hardly find an inch to step that wasn’t on someone’s hand or foot. And it was sweltering. We looked left and right, searching for any hint of an exit, and were pushed along like cattle. We had no idea where to go, where our driver would be waiting for us, or if he’d even be there at all. (It should come as no surprise that we arrived in Calicut several hours late.) Numerous hands flung at us in what we could only assume was a cry for change, or perhaps an unrepeatable curse as our bulky backpacks knocked into people without remorse. We shimmied our way up and down stairs, our sweat growing from a trickle to a pour, in tandem with our stress. “Hey, hey,” a man said, but we walked by without acknowledgement, eyes fixated on what we hopped was a taxi line. But no driver. “Hey, hey,” a familiar voice said. Again, we walked by, helplessness and tension radiating from our foreign bodies. If I ever doubted his disdain for us, his driving proved otherwise. We flew through the streets of Calicut, slamming on the brakes every minute to avoid running over the floodgate of students that had just finished school. The next second he’d press his entire bodyweight into the gas, sending us lurching forward and gasping for air. I could feel my neck begin to burn as the seat belt progressively tore into my skin each time it locked into lifesaving position. I’m shocked I didn’t cry (or pee my pants), as my body got repeatedly propelled and then smashed. But navigating the city was smooth compared to what was to come. Our surroundings changed from stacked buildings to open air covered in a thick fog, the outline of mountains hardly visible. I prodded Dom. “Look!” He forced a smile, his hands gripping the seatbelt. It was as if he knew our journey had only just begun. We spent the next four hours flying through narrow mountain paths, cheating death with every turn. The dirt roads were more like bouldering paths in places and the barriers between said so-called road and the cliff below were mere inches — they couldn’t even keep a pebble from falling to their demise. My crippling fear of heights sent me into a deep silence. I tried to close my eyes, but it only made it worse. I thought about looking at Dom, or grabbing his hand, but I knew acknowledgement of our situation would only make it worse. And then we stopped. Our driver got out of the car, kicked the ground, and walked past the line of the halted cars. I looked at the time. We’d been traveling for 18 hours. As we waited in silence, our driver continued to curse and pace. Vehicles continued to cascade down the hill; we stayed in one place, waiting, without a driver behind the wheel. “It was probably a cow crossing the road,” our hosts would later tell us. After many sighs, inner cries, and a few ambulance sirens laters, we started moving again. 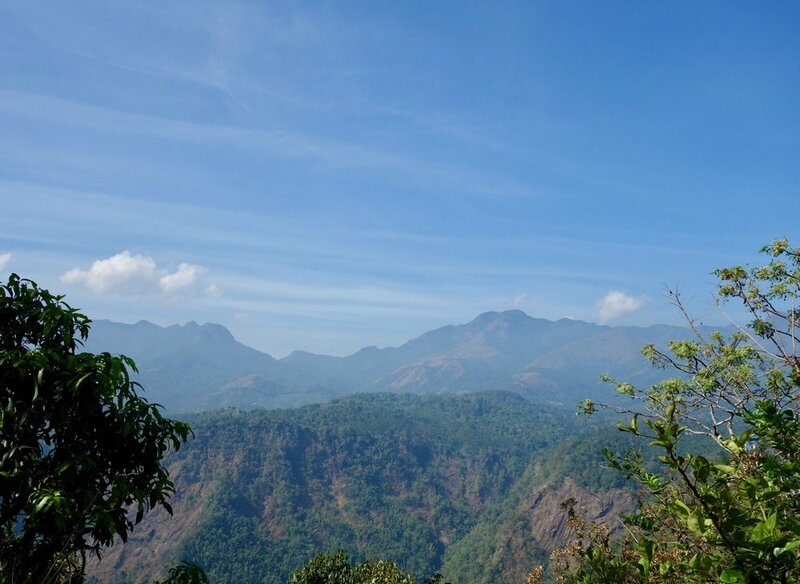 It wasn’t long after that I saw the light — or rather, a sign that said, “Welcome to Wayanad!” I exhaled so deeply that my body shrunk to half its size. The cliffs were behind us, and bed was near. “Address?” I blinked as his bloodshot eyes stared into what felt like my soul. “Address.” He said again, this time not a question, but a demand. He pulled over, slammed on the breaks, and stopped the car. I started to panic. We hadn’t written down the address (amateurs) — or the phone number (fools). Google wouldn’t load. I was certain this was the moment he’d leave us on the side of the road, caked in dust from the windstorm he’d start as he sped away. Thanks to a few strokes of luck, and the grace of the WiFi gods, we eventually made it to Aranyakam, our homestay. We shared our story over coconut chicken stew, pea curry, ghee rice, beet chutney, and several more plates of equally as delicious home-cooked food. I credited the taste to the fact that we’d survived on train food for the last 24 hours, but would later learn that it was simply that good. “You look tired,” they said. We collapsed under our mosquito net and let our dreams wash away the horror that was our day. I woke up to light peeking through the linen curtains. I could see trees blowing in the distance. When I pulled back the curtains, I gasped. 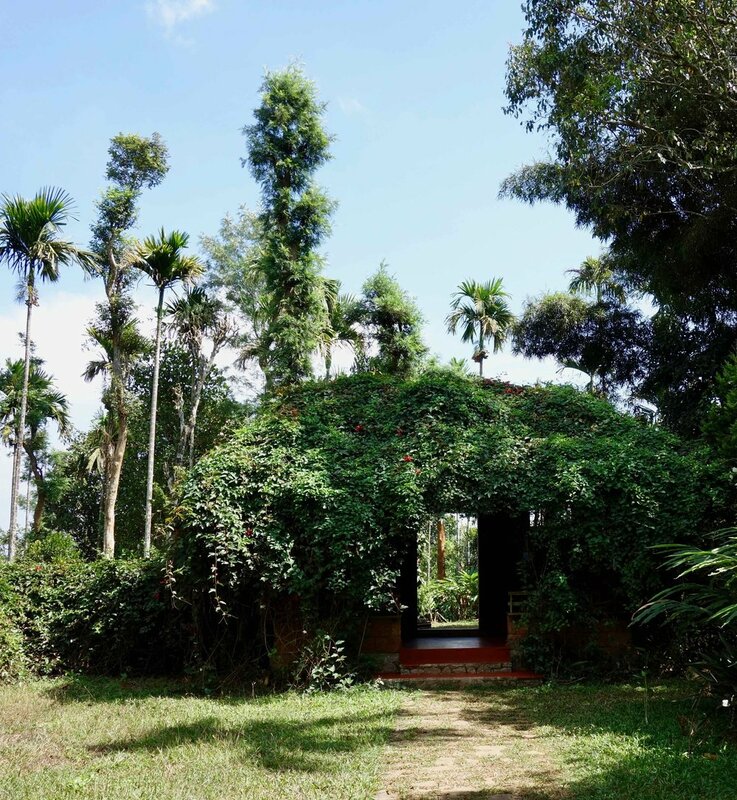 Nestled on the edge of a coffee plantation, we were surrounded by lush greenery, spice plants, endless hills and valleys… Were we dead? Was this heaven? Breakfast was further proof that flavor pulsed through Neema’s veins, that culinary artistry lurked in her DNA. She handed us a plate of bite-sized deep-fried banana muffins. I ate one, then two, then three. Then I remembered to breathe, and went back for more. The other guests began to trickle into the communal eating area, a motley crew of Sussex dwellers, eager to be entertained by the young hooligans who finally showed up. Honor was, no doubt, the queen bee of said group. She seated herself at our table, asking endless questions and dotting on us like she’d known us since birth. We loved her. Fortunately for us, and for Honor, we had other plans. It felt right that after 20 hours on our butts that we should move our bodies and go on a hike. One hand-drawn map and huge water bottle later, we were off to find the local waterfall. We attempted to follow the path, turning the map upside down, to the side, trying to decipher if the road marked was the dirt path or the gravel. With the numerous long driveways, many of which resembled hiking trails, this was quite confusing. Many wrongs turns, religious murals, and golden gates later, we saw the sign for the waterfall. To call the streaming water impressive would be a lie; to call it a waterfall an overstatement. But there was in fact water falling over rocks, and we had in fact moved our bodies and even worked up a decent sweat. Not so bad for day one. And the chicken and chili omelet Neema made us when we returned made every wrong turn and uphill battle worth it. The next day, we decided to embrace our inner tourist — don’t tell Honor — and ventured into town with Ganesh, a man with a contagious smile and vigorous head wobble (the first of many we’d see in India). He took us to the Edakkal Caves, which included an hour-long climb with hundreds of students in multi-colored uniforms, all eager to shout “hello!”, ask where we’re from, and take a selfie. The inscriptions on the stone walls at the top of the hill were incredible, but like many touristy experiences, the amount of people took away from the magic. The shouts of children echoed in the tiny cave, someone bumped into us every few seconds, asked us to move, and jumped in front of the lens before we could snap an undisturbed picture. We left the caves within minutes, took in the view from the top equally as quickly, and fled down the hill. We then made our way to a flower festival. We’d asked to see another tourist gem, the Jain temple, but Ganesh took us here instead. Perhaps Honor had phoned him. I’d never been to, or heard of, a flower festival. It was an odd combination of a children’s fair, EDM festival, and agriculture exhibition. Music blasted — "Despacito", oddly enough, played on repeat — a strange ride or activity was around every bend, and melted ice cream covered the ground. We paused to stare at a group of schoolgirls dancing on a stage, jumping up and down, hands in the air. When they noticed we were watching, they all turned, waved, and started singing even louder, as if we were scouts looking for the next Hindu pop star. We shared a cone, dip a lap, and returned to our sherpa, Ganesh. After a quick stop for funky biriyani in an even funkier locale, we made our way back to the oasis that is Aranyakam. We spent the rest of the day reading, writing, and playing cards on the balcony, soaking in the breathtaking view, counting down the hours until dinner. Every meal surprised us — from coconut and cinnamon filled dosas to sponge-like rice pancakes (called appam) we used to shove mouthwatering curries into our mouths to the grapefruit pulp salad — and we couldn’t get enough. 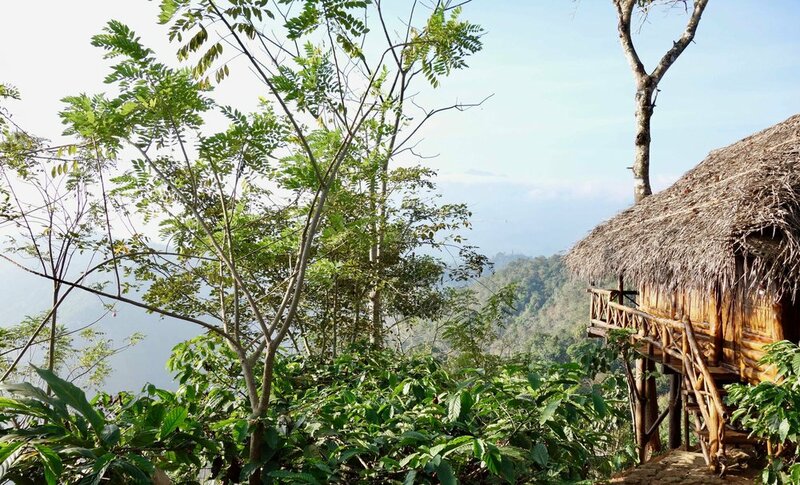 Every time we sat down we assured ourselves we’d eat less, and not stuff ourselves to the point of stomach cramps, but each time we retreated to our treehouse, we walked clutching our bellies. Though we felt like we’d just gotten there, it was time to pack up and leave again. We didn’t want to say goodbye to the first place we truly loved in India, but we knew more tea-covered hills awaited us in Munnar. Fingers crossed we’d make it in one piece.